I was feeling lazy last night. All I wanted to do was put warm food in my mouth and watch a movie. Problem was I didn’t have anything I could just warm up and eat . . . which meant I had to cook. I groaned at the thought. I’d been grocery shopping all day and had tons of interesting food laying around my house but no energy to put ingredients together into a meal. 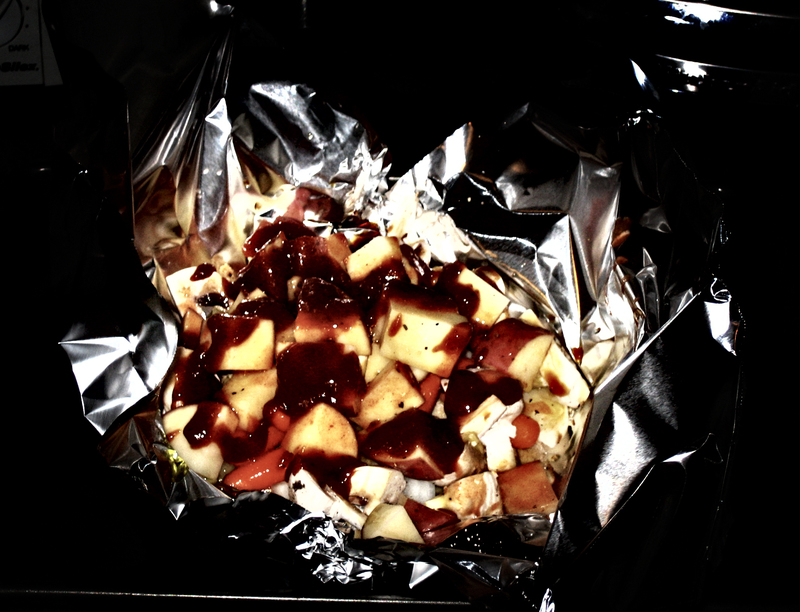 Eventually, I dragged myself into the kitchen and decided to make the laziest food I know how to: Hobo Packets. I’ve encountered several recipes for hobo packets. Most of them cite the reasoning for the name “hobo packets” is that they are made of cheap food, can be cooked on just about any heat source, and you don’t need a plate to eat them off of, you just eat them right out of the foil! So, they’re designed by/for those people who don’t have proper kitchens to cook in . . . hobos, really. Because of this, these make awesome camp food. You don’t have to cook them in the oven as instructed here. You can just bury them in the hot coals of a campfire for an hour or so. Like I said, just about any heat source will work. And you can make the packets themselves in your kitchen before you leave, store them in a cooler and then just cook them up at dinnertime. The concept was pretty easy to veganize, since the only non-vegan ingredient in them was meat and there are TONS of meat substitutes available on the market. Just as a note, I don’t know that I would recommend subbing tofu in this dish for the faux meat. This is a wet cooking method. And I find that tofu has a more pleasing texture when it is fried or baked. Maybe thawed frozen tofu would work? But I haven’t tried it. As I said, I was being lazy last night. So I made ugly food and when I took photos of it, I made no effort to make them look good. I didn’t frame well, I used a flash, it was kind of like I was trying to take bad pictures. Today, I photoshopped them . . . to make them look like lomography! (It’s one of my favorite techniques and the tutorial I base my technique on can be found here.) Be sure to click on the pictures in this post, they get bigger and they’re prettier that way. So, without further adieu, it’s time for a lomographic adventure through . . . I make my hobo packets with two components, the food component and the sauce component. When all the vegetables cook in the packet, they leak out flavor all over the place and add to the flavor of the sauce that ends up in the bottom of the packet. I layer my ingredients in a specific way . . . kind of. They fall all over the place anyway, so it doesn’t really matter. Here’s what you do . . .
Preheat your oven to 400 degrees Fahrenheit. Get yourself a big ol’ piece of aluminum foil, about 18 inches long or so. I put it right on top of a cookie sheet, even if it’s bigger than the pan, just so I don’t have to move over there later. Then, schmere about a tablespoon of olive oil in the middle, making a puddle big enough to put your fake meat on, about 5 inches in diameter. Now, put your meat on top of the puddle. Lay your slices of onion on top. 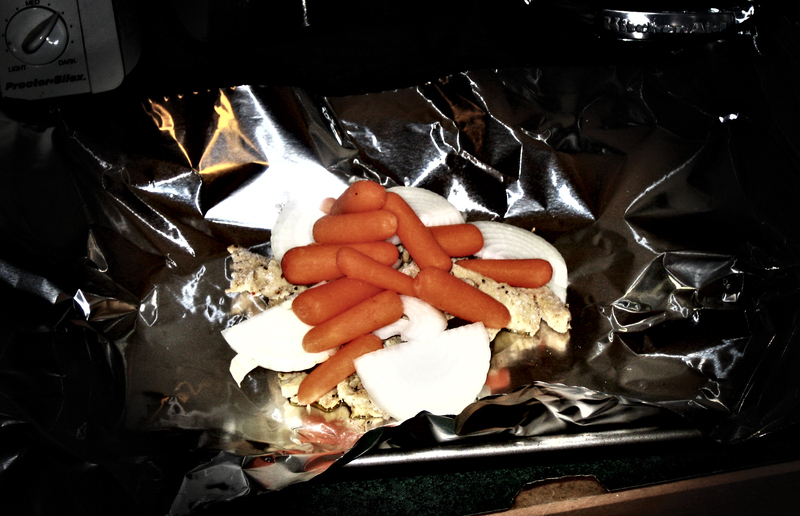 Then put the carrots on top of the onions. At this point, you’ll probably want to start pinching the sides of the foil together so you’ve got yourself a little bowl shape. After about the third layer, ingredients start falling all over the place, and if they do that, the packet gets really difficult to seal at the last step. I also throw some salt and pepper on at this point, just to season up the aromatic vegetables. The salt also helps them expel some water when they’re cooking. 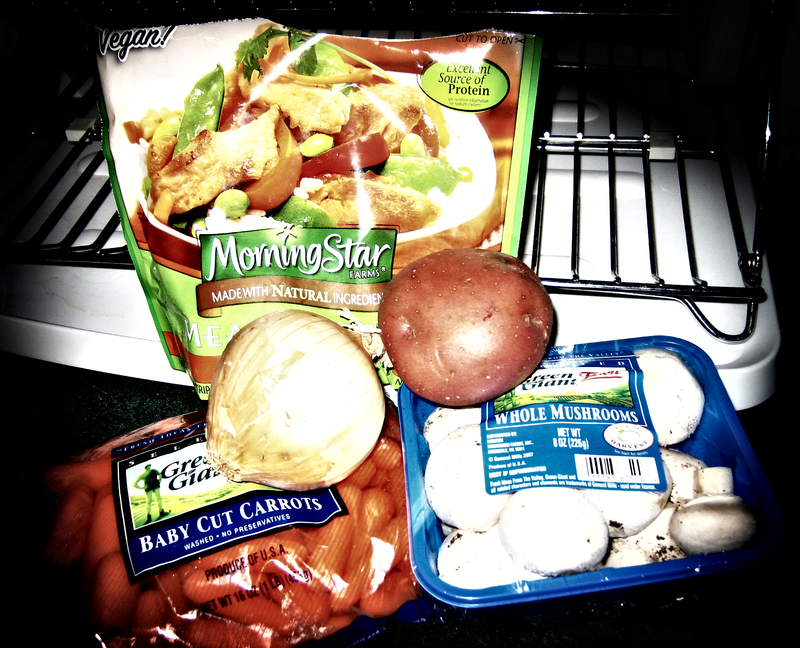 Now put the mushrooms on top of the carrots and the potato cubes on top of those. Ta da! All of you food components are in the packet. Now it’s time for the saucing. Start by putting another sprinkling of salt and pepper on top. You need to make sure everything is very well seasoned, otherwise your packet will be bland. No one wants a bland packet . . . that sounds dirty . . . moving on . . .
Really, you can use any sort of sauces you want on top. The one’s I’ve listed in the ingredients section are what I’ve found make the best sauce for this dish. Feel free to experiment. Drizzle everything with a good dose of olive oil, a tablespoon or two. Next shake on some soy sauce. Just a teaspoon or so. 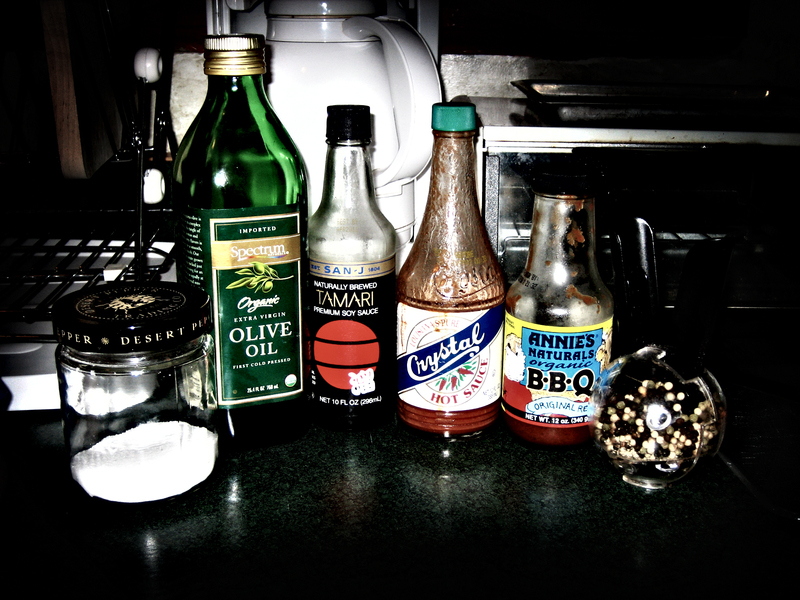 Then, pour on 2 to 3 tablespoons of the barbecue sauce. Lastly, add some hot sauce if you’d like to give it a kick. It’s okay that all of this ends up on the potatoes. It all slides down through the vegetables, picking up flavor on the way, and simmers through your protein of choice. Because the packet is sealed, it circulates all the flavors are locked in and sort of percolate through your food. Next, you need to seal the packet really, really well. 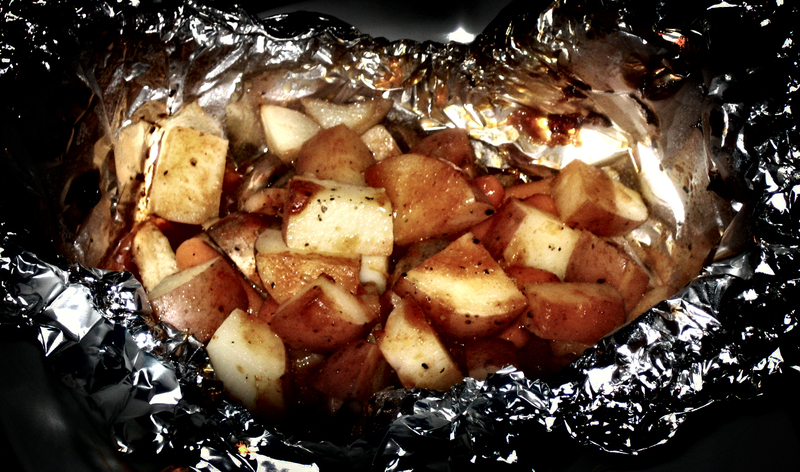 Crimp the edges of the foil all the way around the food two or three times to prevent all the delicious from escaping. 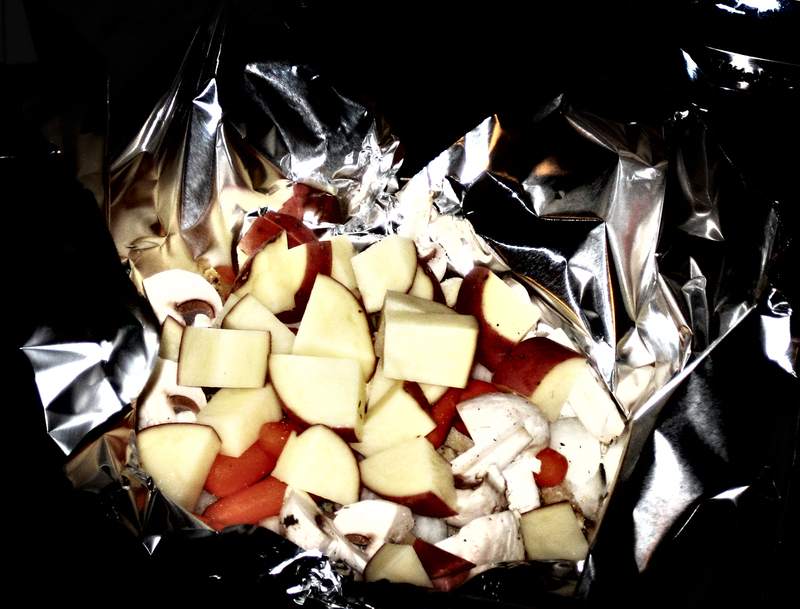 If your packet is already on a cookie sheet like I advised, great! If not, put it on one. Then stick it in your preheated oven. This bakes for 1 hour. Yeah, it takes a while, but it’s worth it. Go start a DVD while you wait. 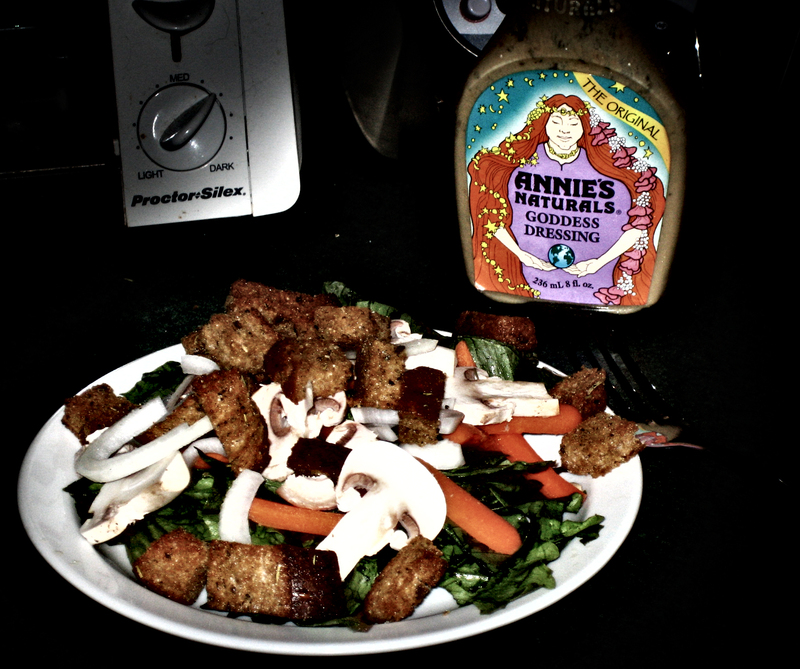 If you’re really hungry, make yourself a side salad like I did. 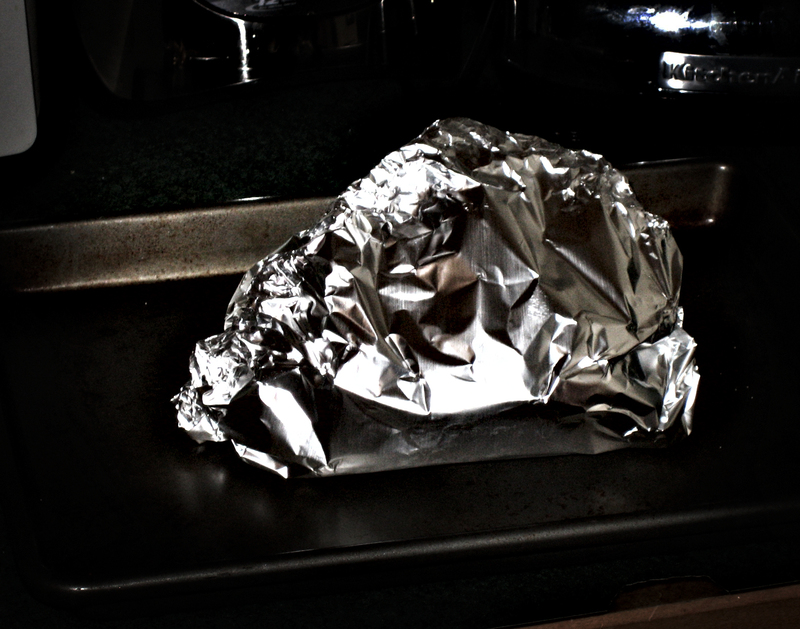 When your hobo packet comes out of the oven, let it sit and cool for at least five minutes. Ten would be better. Then put it on a plate and carefully open it up. There’s a lot of steam in there, and you don’t want it burning you in the face. Make a little bowl out of your aluminum foil and and eat! The quantities I gave you up above make a lot of food. So, if you’re not really hungry, use less. I was FULL after I ate the whole packet last night. Granted, I did have a salad beforehand. Oh, the sauce is really the secret to this meal. The sauce ingredients seep through all the vegetables and pick up all kinds of deliciousness. There’s a good puddle of awesomesauce at the bottom these packets once they’re baked. Usually, after I’m done eating, I sit there licking the sauce up with my fingers. Classy, I know, but it’s soooooo gooooood! In the end, this recipe did the job of satisfying my craving for warm, simple food while I curled up in a blanket on my sofa, watched Rushmore, and drank a whiskey sour.